As described in Toe By Toe Best Practice parents and schools are in the frontline when delivering Toe By Toe. But the way schools innovate using Toe By Toe has been hugely impressive. Let's share with you some examples of schools' innovation using Toe By Toe. This includes the use of a wide variety of key personnel and methods imaginatively adopted when using Toe By Toe with struggling readers. Let's look at some now. Toe By Toe schemes in the majority of schools in the UK are run by teaching assistants (TAs). Given their workload, most teachers do not have the time to give 20 minutes of individual attention to one child. As a result, most schools use TAs in the role of Toe By Toe tutor. For TAs or, indeed, anyone tutoring with Toe By Toe, it is vital that they carefully follow the instructions as laid down in the manual. As long as they do so, no formal training is required. Naturally, the more experience anyone has delivering Toe By Toe, the more competent and confident they will become. The teacher or Special Education Needs Co-ordinator (SENCO) may prefer to monitor progress carefully the first time a TA uses Toe By Toe with a child. But as already mentioned, generally a TA quickly learns how best to deliver the training. It is also fulfilling for a TA also as they see a child’s confidence and ability begin to blossom. One school which runs a particularly well organised and highly successful Toe By Toe scheme along these lines is Lindley Junior School in Huddersfield, UK. In 2007-08 the school was rated as 'outstanding' by the Office for Standards in Education (Ofsted) 2007-08. This was in no small way thanks to the efforts of the SENCO, Ruth Shimell. Ruth organised TAs at the school to work with the children for five 20-minute sessions every week, on a daily basis. At the weekends, most parents assumed the role of tutor at home with their children. The Toe By Toe intervention at Lindley began in earnest in 2003 and impressive results were returned for nearly every child who enters the program. In November 2007 the school reported that a total of 53 students had completed Toe By Toe. The average time taken to finish was 17.5 months and the average improvement 37.2 months (as measured by Schonell). 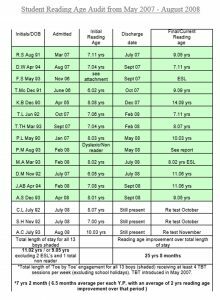 The following chart shows by how much many struggling readers improved their reading age in a short time at Lindley. “Moor House School, a non-maintained residential special school. It is nationally recognized as a school which initiated, and continues to lead, the specialist educational field for children with specific speech and language impairment. Many of our pupils have associated literacy difficulties and we are constantly researching suitable resources to help in their learning. Toe By Toe was first introduced into school 6 years ago and trialled on just one pupil. Since then the numbers have grown and grown and we currently have around 50 pupils on the programme. We also have a small number of pupils using Stareway To Spelling and Stride Ahead. In order to ensure that each pupil receives the individual time required we have introduced a system whereby 20 minute slots dedicated solely to literacy are allocated to classes first thing in the morning. During this time the school operates an ‘all hands on deck’ approach. That is, staff from all departments be it administration/office staff, domestic staff, senior management and of course the bank of classroom practitioners including teachers, speech and language therapists and special teaching assistants, all provide the individual support needed within the targeted classrooms. Another innovative literacy scheme is in operation at Toothill School in Bingham near Nottingham, UK. They have been running a highly successful Toe By Toe scheme for more than a decade. Teachers, parents, teaching assistants and fellow students all act as Toe By Toe mentors. The scheme was instigated by Deputy Head, Wendy Nelson, but is now run by Senior Teaching Assistant, Sue Bird. Glebe School in South-East London, UK, is a large special school for students aged 11-19 recently classified as a ‘Specialist College for Cognition and Learning’. Originally, the school catered for students with moderate learning difficulties but it now meets the needs of a more complex, educationally diverse student group. Glebe originally began using Toe By Toe on an ad hoc basis. But when Sue Barrell joined the school as an English teacher in 2003, she realised that a school-wide systematic approach was required to help the many students at Glebe with low reading ages. She considered that Toe By Toe would be an ideal fit for the school and students. Sue had the invaluable support and encouragement of Keith Seed (Head) and Chris Collins (Assistant Head). This wider scheme was an instant success and the number of students using it continues to grow steadily. At present there are more than 40 students working through the manual. Four teaching assistants and Sue herself work with students every day during the school ‘literacy hour’ with sessions lasting 15-20 minutes on a 1:1 basis. Sue attended two Toe By Toe training courses in the South-East. So impressed was she by the training, she invited Keda’s son, Frank Cowling, to provide a literacy workshop for local schools and interested parents in November 2009. This too was a great success. As a result, a handful of parents now give extra Toe By Toe sessions to their children at home. Sue has also started a ‘Buddy System’ at the school and has plans to involve more and more students over time. Age and distance is no barrier to 82-year-old retired New Zealand teacher Keith Webster. Keith came up with an innovative way to teach his own son how to read. Keith read about the astounding success of Toe By Toe at Linwood College in Christchurch, New Zealand. Intrigued, Keith wondered how he could us it to help his son to read. Although Keith and his son live far apart, Keith decided to try ‘distance learning’ and tutored Toe By Toe over the phone with his son. The results have more than justified the phone bill! In addition, Keith is now teaching a 69-year old to read using Keda’s ‘Little Red Book’. Truly, Keith is an inspiration to us all. Many UK schools select responsible Year 6 students to act as 'Mini Teachers' in assembly time using a Mini Teacher Assembly Book to monitor behaviour. The class teacher can then be released to provide Toe By Toe coaching to students.